The Wide Cylinder Planters from Satu Bumi’s Standard Range of GRC Planters & Bowls are sturdy, well finished and competitively priced. 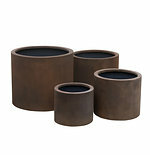 The Wide Cylinder Planters come in four sizes with a variety of nesting options. Each planter is available in both raw concrete and a number of different old metallic and old stone oxide colours that provide a traditional and appealing aged appearance.